The Art of Molly Crabapple Volume 1: Week in Hell is up for pre-order! The journey of Week in Hell from crazy idea on how to spend my birthday to mad week long art binge to art book put out by IDW is something that fills me with all sorts of butterfly laden joy. And to celebrate, I ran a contest asking you to send me your receipts for pre-ordering from both online sources like Amazon.com and from your local comic book store using its Diamond code, JAN12 0483. Our winner in the online category is Logan Riley and from the local comic book store it’s Steve Mills! 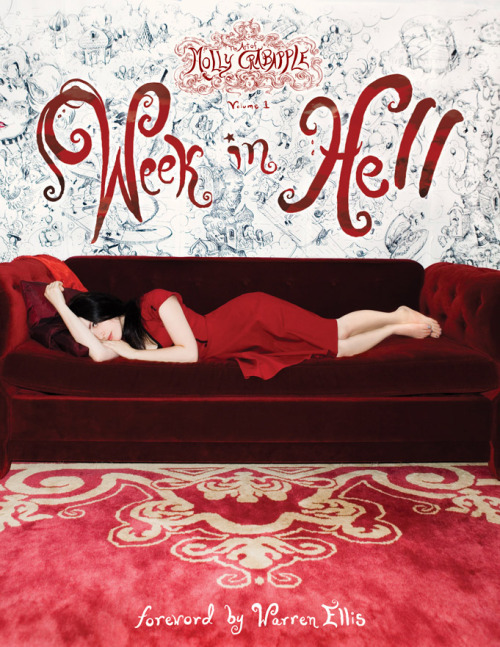 The winners will receive one 11×13″ cut of the original Week in Hell wall! Thank you so much for your support! I’ll be signing in a few locations in NYC and London after its release, so keep an eye out for those announcements. This entry was posted in Uncategorized on February 3, 2012 by Molly.